This is for the one who thinks they’re not enough. This is for the one who is striving and struggling. Who is trapped in fear’s clutches. Who is bent by harsh words. Who is broken by cruel deeds. This is for the one who feels alone. Even in the presence of others. Even on the highest of mountains. Even when everyone says you shouldn’t feel what you do. This is for the one who is empty. Who has thirsted for more. In your weakness, in your failings, in your unworthiness. With your fears, rejection, and emptiness. You are enough, because He has made you enough. Your worth is not measured by this world. It is calculated by the One who created you. In His eyes you are valued as priceless, precious, chosen and redeemed. 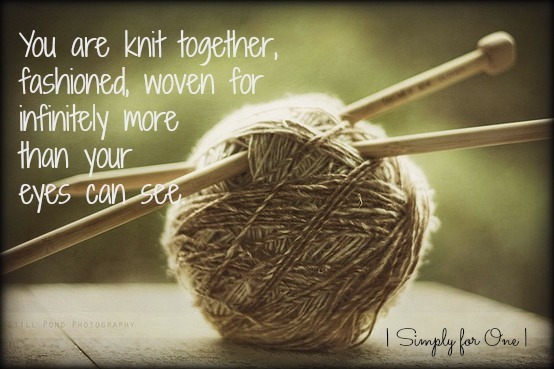 You are knit together, fashioned, woven for infinitely more than your eyes can see. In Him, is all fullness…you can never be empty in Christ. He is the Source – Everlasting, Unending, Bottomless. Pray. Seek. Cry Out. He hears your plea. If all you have are tears, trust that He counts each one. Words are not necessary when He sees the depths of your heart. Let go. Give in. He knows what you carry. Bring Him your weariness and let Him fill you. Drag in your fears and hurts and allow Him to heal. Surrender your flesh, hand over those sins, and He will scatter them like mist. Hold out your cup…in Him it runs over. You are enough, because you are His. You are enough, because He was enough. His work is finished. He paid your debt. You are free from the chains of less than the others. Don’t compare, don’t compete, just rest in enough. Savor the lavish love of the God who made you and does not forget His own. In Him, you are more than enough. Joyfully joining a few new link-ups this week with Kelly Balarie and Holly Barrett. Continuing to join with the beautiful blogging communities of Holley Gerth, Kristin Hill Taylor, and Jennifer Dukes Lee. Originally published on Simply for One – September 2014. Haha…yes, percolating for sure!! I agree, it is a message women need to hear…especially when the enemy tries to sell us lies about our value and worth. So glad you stopped by today. Blessings to you! I’ve been listening to this song lately – https://www.youtube.com/watch?v=6oZuNkT7_UM – and it embodies this same, much-needed message. So grateful for your words and heart. You have a heart of gold & I love that God is using you to speak life and truth into others’ lives. Tears, sweet Tiffany. I needed to read these words today. It has been a day that threatens to consume with its stresses and worries. There is a situation that is beyond my control in the life of a loved one. But your words remind that I am enough, just as I am. It is not my burden to bear, or my responsibility to change. I need only draw close to Him to fill me with strength, and rest in the knowledge that I am enough – I am loved just as I am. I am equipped for what He has called me to do. He will take care of the rest. I am enough. Me too…so blessed he sees it ALL yet still loves so completely. Thank you for stopping by! I love reading reminders of how enough I am in God. Thank you for this beautiful, truth-filled post! I really enjoyed reading your post today. Thank you. What beautiful words you’re sharing today, Tiffany. My heart says YES to this: “In His eyes you are valued as priceless, precious, chosen and redeemed.” I’m glad you resurrected this beautiful poem for those of us who hadn’t read it yet! Thank you, Betsy. More proof that His plans are always best. ;) So glad you came by today…you are precious to me as well. Thank you for these beautiful words, Tiffany. I’m so glad that I don’t have to ever rely on myself to ‘be enough’ because HE is enough. I’m a pretty paltry offering or vessel or tiny grain of salt–but in his hands, I become all he needs me to be–which is enough :). “You are enough, because He was enough.” I can never hear this too many times. Beautiful, beautiful post, Tiffany. He is all sufficient, isn’t He, Lisa. You are right, we can’t hear that too much. Thank you for visiting tonight. Such encouragement I have been in that place of feeling alone in a room full of people. It isn’t a fun place to be.Your words are a blessing, Thank you. Praying for you as you continue to wait for the words that are being refined. It isn’t fun at all, Dawn. I think that’s why it brings such comfort to know that not only does God see us, but He moves in our lives to bring us closer to those people who can cut through the loneliness. Thank you for your prayers…I appreciate them. So glad you visited…you are always welcome here. Hugs! Tiffany, your words of truth are beautiful. I linked up beside you at RaRalinkup but for some reason my current blog post came up for you. I had posted this:http://jeanniepallett.com/papa-loves-you – kind of like one heart, one mind in Christ! Love that one too, Jeannie! So glad you visited today and I’m glad we got to be neighbors. Blessings & Hugs. So beautiful…. this will be touching hearts today that thought no one would see them… God sees… and He cherishes each one! Amen – He does indeed and I, for one, am so very grateful. And I cherish you – thanks for visiting! “Words are not necessary when he sees the depths of your heart.” So, so true. Yet I find myself trying to fill the quiet and work things out on my own. Thank you for sharing once more! Oh, me too, Samantha. We work so hard when He longs for our worship. Here’s to resting in Him.